SEO forums rules: No spam! Our SEO services forum is only to post about our own services and to keep in touch our clients. If you try to post about your own service, is possible to delete topic and at least links will be deleted for sure. SEO services from 3D Web Design: We are not spammers – 3D Web Design are internet marketers of high quality services. Our SEO business does not rely on some luck or on short loopholes in Google algorithm. We at 3D Web design are constantly evolving and we rely on hard work and determination to make the things in right way – this is the way to survive in the SEO business! 3D Web Design prices for copywriting and Link Building services - blog posts in English websites with high PR. 1. Prices to publish written from you articles in high PR blogs. 2. Prices for copywriting services in English. and 3. Full SEO Package: planning your campaign, writing and publishing blog posts in high PR English websites, tracking your campaign - prices for complete Link building campaign. We provide SEO service for blog posting. You pay once for publishing articles in English blogs. 3D Web Desing offers link building in over ten thousand quality English websites. About 3500 of these websites are English social networks. The rest of them are ordinary English websites and blogs. - Only qualitative websites in which is published only qualitative, human written content. - All websites are indexed by Google and they're only in English. - You won't recieve article and link from website with Google PageRank less than 1, over 80% of the websites are with Google PageRank 2 and 3. - We guarantee quickly indexing of all articles. - The blogs are owned by different people and they have various themes and content. - The blogs have different IP addresses and they're hosted in different countries. - The content is checked for uniqueness before the publication. If the uniqueness of the content is below 70-80%, the article won't be published. - Only the publications in English are allowed. The content is checkes for quality before publishing. If the text is with spelling mistakes or isn't written in correct English, or in the content there's link to site or page on forbidden topic, the article won't be published. - These are not websites which approve the publications automatically. - These are not websites where everyone can publish - sites are private. - This is not paid links service. You pay for these publications just once. You pay only for texts writing and for getting permission of the blog owner to publish advertising article in his blog. - We can not publish articles of banned topics (ad*lt, s*x, medicines, weapons, gambling) in these websites. - In neither of the articles there can not be link to website with banned topic. The moderation is extremely strict! - To publish 100 articles in high PR English blogs - $140. - Publishing 200 articles in high PR English blogs - $230. - To publish 300 articles in high PR English blogs - $340. Only one outbound link is allowed in each article for maximum quality of the service. In the prices above isn't included copywriting, which means that you must provide the articles. You must provide articles as text files with HTML inside (include links and optional: pictures, paragraphs, h1 and h2 tags, lists). These prices aren't for (spinned articles! It comes to the corresponding number of totally unique articles, written especially for you! You can even give us 100 completely different sentences for topics and you'll get 100 completely different articles - one for each sentence. 100 articles would be written by at least 15 different authors, 200 articles would be written by at least 25 different authors. This means that the articles would be written in at least 25 completely different copywriting styles and you'll get much better results in Google - there's no way the search engine to find out that all of the articles belong to one owner and that they're written for link building campaign. The number of articles published per day is by your request - it can be published with your speed. (Speed must be between 0.5 to three articles daily per domain -randomly 3 to 10 articles per week). Because of Google Penguin, we recommend you to be published max 2-3 articles per day which are pointing to one domain and it would be better if they don't point to one URL address. After you've ordered articles, you'll recieve them on your email. You can review them, to edit them and to add links to your website in the article wherever you wish. After you confirm that the articles are ready to be published, we'll publish them by the schedule you've defined. The articles are published only in qualitative blogs which are 100% indexed by Google, they're not banned and they don't have penalties. 80% of the articles are published in blogs with Google Pagerank 2 or 3, all articles are published in blogs with minimum Google Pagerank 1! Notice: The services should be prepaid. You'll recieve an invoice if needed, our compant is not registered for VAT. If you want invoice, you must pay only by bank tranfer or cash (invoices are possible for bank transfer or cash payments only). In copywriting service cost is not included planning of campaign - the keywords list, articles topics and links in the articles have to be set by you. You can pay partial - month for month. What is the number of the websites? The number of the websites is over 3000! This means that on most topics articles can be published in new blogs every time. You can contact us to send order from here. We can't give exact price for this service, because every client orders unique campaign and different number of articles. You can order these services online and you can also pay online. Pictures shown real results from two different SEO campaigns made for two different websites - the picture above is from a few months ago and the below picture is from the last month. 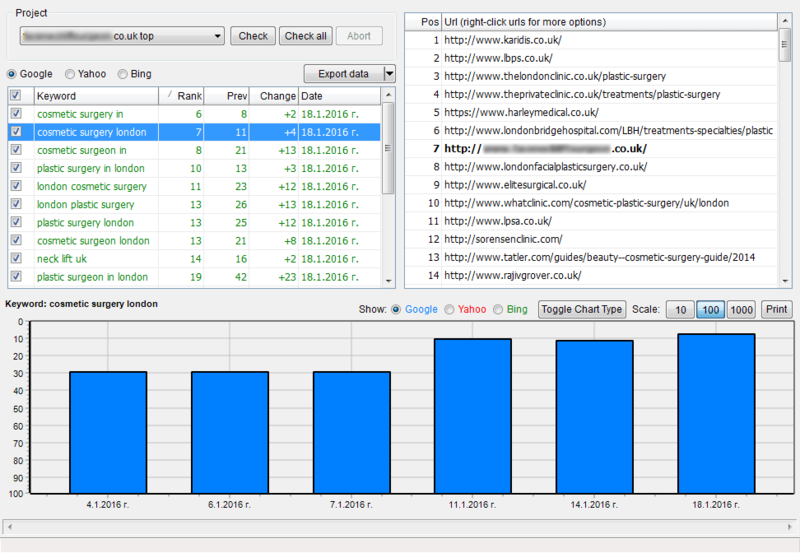 The result after this seo campaign: main keyword "cosmetic surgery London" ranking - in top five Google results. 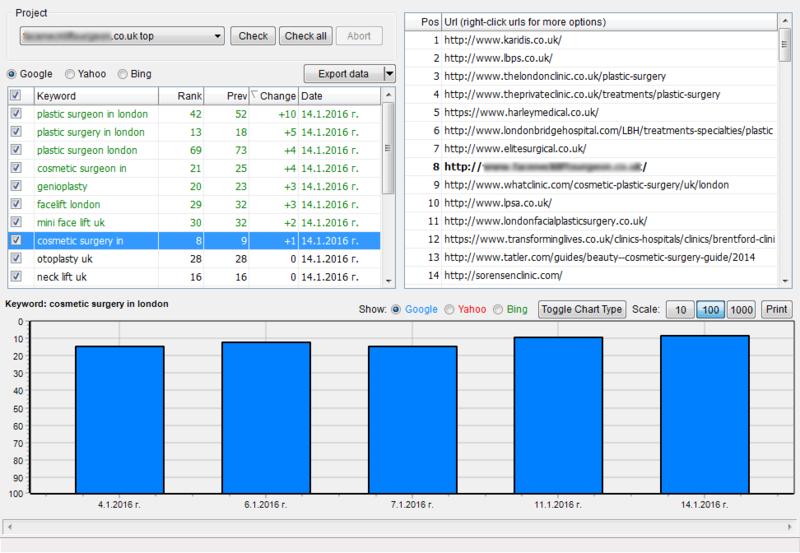 Others about 20 similar keywords like "plastic surgery London" and "plastic surgeon London" in top 10 and top 20. 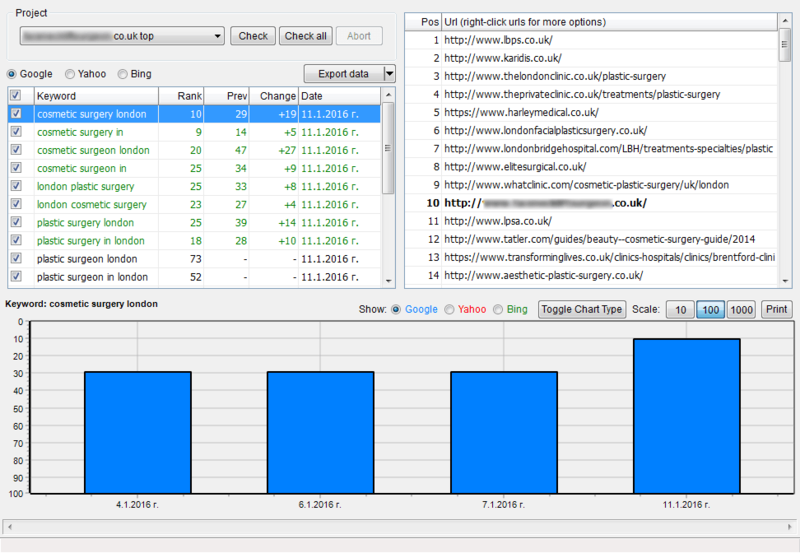 Note: All results are from Full package described in next post combined with our HIGH PR local directories service! Fast SEO audit (we will check your backlinks and anchors with paid Majestic account and your ranking - with paid Semrush account). 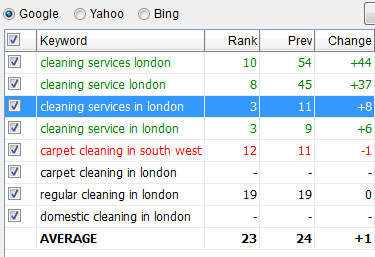 Keywords research, keywords analysis and planning your campaign. Google Penguin safe service: We will calculate anchors percentages needed to achieve best results in Google). Writing articles (we will plan and write all - titles and content of articles. Will be created only useful for users articles, only on useful topics). Articles are written by humans - by native English language copywriters. We will add links and pictures inside articles. We will post your articles in private High PR websites (not in public low quality article directories). Tracking your campaign. We will track your ranking in Google. You will receive weekly reports with your rankings for to 10-15 different keywords - for all period of your link building campaign. Tracking links within your campaign and reports. You will receive report with your backlinks. - Guest blogging (permitted by Google link building tactics), without risk to your website. - Writing of 70 unique articles of 150-200 words. The articles would be written by at least 15 different authors. This means that the articles will be written in at least 15 different writing styles and you'll get much better results in Google - there's no way the search engine to find footprint for this link building campaign. - Articles posting only in websites with Google PageRank 1 or higher. The articles are posted in websites with good Trust Flow (TF or "Trust Flow" is Majestic site quality parameter). - The articles will be published for one year. You will not have any costs for the next 1 year. After this year, price to renew articles for one more year is only 120 USD. - The package of 70 articles can be divided between two sites - i.e. you can order two packages of 35 articles for two different web sites inside one 500 USD package. The price is $500, which means that every written and published article costs only $7. And $7 per year costs you only $0.6 for every link to your website per month. With our SEO services you recieve links to your websites only from quality unique content and the content is written especially for your website and for your purposes, exactly on your topic. That's why the results in Google are really impressive. Optional (30-40% better results!!! ): Writing and posting of 70 longer articles (300-320 words) - package price $650 USD. Our service works from 4-5 years, sites are about 500 (most of them bulgarian), but we have over 120 english language sites in several niches.